Mark serves military families on the homefront as a volunteer for Project EverGreen’s SnowCare For Troops initiative, sponsored by THE BOSS Snowplow. 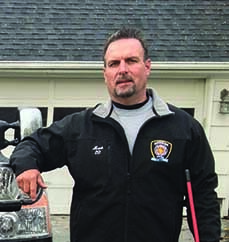 Mark’s desire to help was made even stronger after spotting a house in his hometown that had three service flags hanging in the window. Each flag represents a family member who’s in active duty overseas. “It was really overwhelming for me to see those three flags. I can’t imagine what that family is going through. All I wanted to do was knock on the door and thank them.” No doubt Mark will get his chance soon. We hope you’ll join him in giving back to the brave men and women of the US Armed Forces who are giving up so much for us. • Loan snow removal equipment to a local volunteer. • Donate money, transportation or gas cards. • Refer a military family. 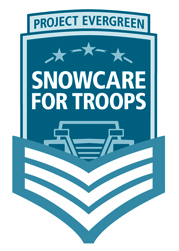 To learn more about how to support SnowCare for Troops, visit www.projectevergreen.com/scft or www.bossplow.com/snowcarefortroops or call 1-888-611-2956.